A bite sized jerky treat made with turkey, brown rice, oats, tapioca, cinnamon, and rosemary. 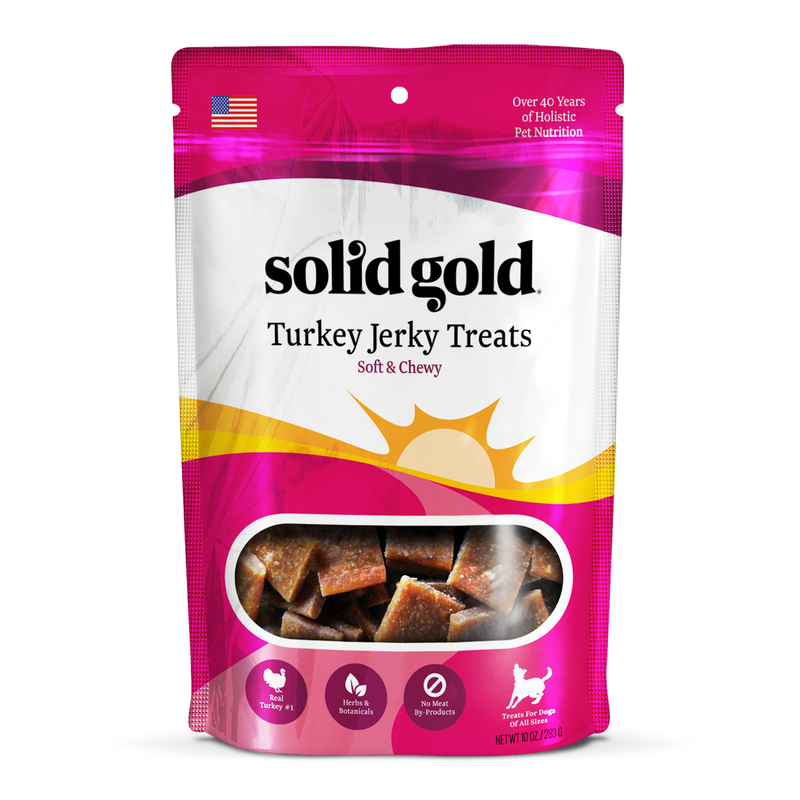 Turkey Jerky is soft enough for puppies or for older dogs with dental problems. Available in a convenient, resealable 10 oz. pouch. 2 Features: Easy to use package, perfect size for smaller dogs. 2 Benefits: Pure ingredients that result in a treat that’s good for them and makes us feel good. 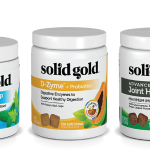 Review: Solid Gold Jerky Treats has been a great product for The Herd. It is a great anytime treat and makes bed time very easy. The quality of these treats are top notch. The Herd loves them, Solid Gold Jerky Treats does not give them gas, which is great for all of us. The treat itself is a great size for a smaller dog. The size is also perfect to put in the rubber chew toys and one treat can keep each dog busy for a long while. We have given a bag of Solid Gold Jerky Treats to other dog family’s both before this trial and during, and have always gotten positive feedback. Thank you to everyone at Solid Gold Northland. Being a part of this program has taught us so much. The staff is wonderful and we really appreciate the time they spend with us and to teach us new things. Review: These are one of my favorite treats since it always gets the dogs’ attention due to the scent. I cut/break them up into much smaller treats and one package lasts a long time. Review: These treats are great for dog training since they are delicious and smell yummy – my dog will work for these! I have a 9 lbs. dog so we need to use small treats and these break up great for this. The resealable bag help keeps them soft and fresh. 2 Features: No wheat or other unhealthy ingredients. Real meat is the first ingredient. 2 Benefits: Soft, meaty treat that stays soft a long time after opening the bag. 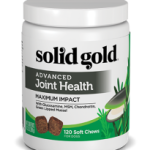 Easy to break up into smaller pieces for training treats or small dogs. Review: My dog is soooo fussy! She won’t eat any baked dog treats and she is picky about the meaty treats she will eat, too, but she loves Solid Gold jerky treats. I love that they have healthy ingredients and unlike a lot of the soft, meaty dog treats, they did not get hard right away after I opened the bag. The bag reseals nicely so they stay soft and fresh for weeks. I also liked that they are easy to break into pieces for training treats. Con: Con… Opie loves these so much he begs for them and bugs the neighbors by showing off his tricks hoping to get extras from them. Review: Opie loves these treats. I have to empty the bag into a stainless container or he sits by the counter and stares at the bag, looking forlorn if he doesn’t get one. I like that they are easy to break into 1/4 inch tidbits for training or so that he gets 15 rewards out of the caloric content of one treat. Opie likes the turkey flavor best, but we mix it up with the other flavors as well.